There's been a lot of skincare testing going on for me lately and one of those brands is F.O.Y or Fountain of Youth. To make it clear from the onset this is a high end brand, or at least an expensive one and more suited to those with mature skins. Gulp - is that me now? You also won't find F.O.Y in your local department store as it's currently only available from these London stockists but if today's post wets your appetite they will be found online very soon. Who are F.O.Y? Originally the products found in the range were developed to provide post-operative treatment for patients undergoing surgery and non-invasive, aesthetic procedures. They were developed to provide patients with a range that allowed them to prolong the results of the aforementioned treatments at home. Once F.O.Y realised that positive feedback from their clients including skin that felt renewed, smooth, supple and radiant they decided to allow those who were not seeking treatments to benefit from the products available. My first thoughts when I saw the products was that it all seemed very minimalist in terms of packaging (if I was to compare to a more well known brand I'd think Clinque) and for a mature skincare range it was kept very simple. Diving straight into the product as micellar waters go F.O.Y Cleansing Micellar Water* this a pricey one at £28.50. The claims listed are 'purifying and deep cleansing', 'moisturising and soothes the skin' and 'acts as a revitalising tonic'. Unlike micellar waters I've used in the past this has a gel texture which I enjoyed but I still can't get away from wanting to do a 'proper' cleansing routine. Of course if you've undergone surgery you may not want, nor be able to get to the bathroom and complete such a routine so this might be wear it steps up. Likewise if you are going to rely solely on a micellar water is it worth spending the extra few pounds? I'll leave you to decide. Containing Panthenol which is renowned for it's moisturising capabilities, increasing hydration, improving elasticity as well as chamomile, ginseng and marigold extras to sooth and calm skin. Finally there is rose water to soothe any irritated skin which would make it useful for anyone who suffered sunburn over the weekend. You will have spotted F.O.Y Revitalsing Eye Gel* in my April Favourites which speaks for itself. A revitalising gel to target wrinkles around the eye which claims to firm and tighten the skin. I always wonder how explicitly I can say a product worked in preventing wrinkles without knowing how many 'you were due' but what I can say without contest is that I have found no creasing in my concealer since I've been using this product which speaks for itself. As I mentioned in my favourites post it will be perfect for itchy eyes due to Echinacea extract and I plan to move this into my fridge for some added cooling benefits. I wasn't particularly enamored by the F.O.Y Moisturising Day Cream* on first sight but I've almost used it all up so clearly it's doing something right. 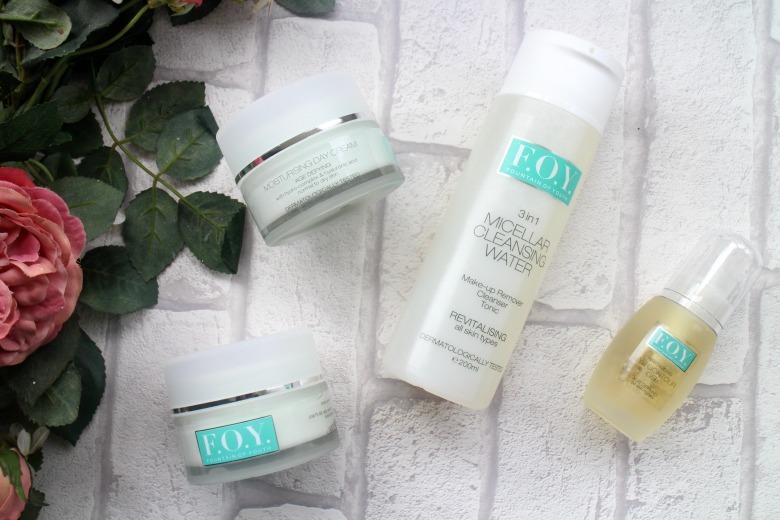 The F.O.Y range is unscented as you'd expect and I think I can often be lead to favour pretty packaging or scents but it was good to use a product where I was able to put those judgements aside. Interestingly this is a product that feels both thick yet lightweight at the same time. I hope that will make some sense. By this I mean it feels heavy on application and it is good to allow the advised 1 - 2 mins to allow the cream to absorb in as I find even the smallest bit appears evident at first on the skin. After those couple of minutes it sinks into skin and its left feeling plump and hydrated without weighing down. Even when the weather has racked up the temperature and London Underground commuting makes things humid I haven't found make up sliding off my face and the odd dry patch I experience here and there has been none-existent which I put down to the inclusion of jojoba which balances oil production. Finally is the product I've reached for least out of the four the F.O.Y Rejuvenating Night Cream*. This is not specifically down to the product more my lax attention to a night time regime and this sitting in a different draw, unlike others which sit in my bedside. I like night creams to have a scent and this doesn't so it may appeal to others but for me it was something I missed. Again this is a personal taste issue rather than fault to the product itself because when I have used it's worked a treat. There's a whole host of ingredients which have benefits to the skin from fighting signs of ageing to stimulating collagen synthesis. Keep your eyes peeled for when F.O.Y is released online, if you have the budget it's worth exploring. While I am not interested in the micellar water as I think the price is bonkers for what it is, I am interested in both eye cream and day cream. I am 37 this year and I look to invest in good skincare and this range sounds great. Now my only hope that they do worldwide delivery. This sounds like a really nice range, I love the sound of the day cream! Shame it's not more widely available!